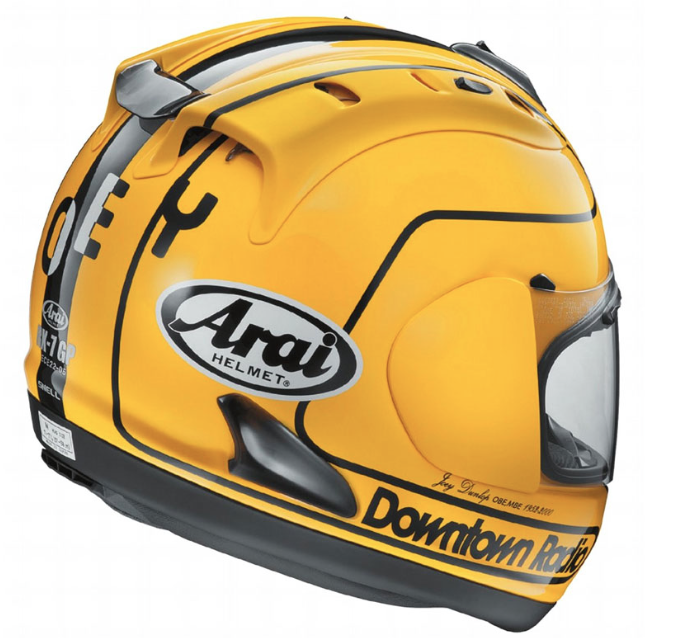 Arai UK and TheVisorShop.com are proud to announce a new Limited Edition RX7-GP Joey Dunlop 1985 Replica Helmet as part of this year’s celebration of Joey’s unique career at the Classic TT. Each of the 300 helmets will be numbered and come with a matching numbered certificate, which will be hand signed by Linda Dunlop. Crossan Motorcycles visorshop.com site is the exclusive European retailer. Arai say it’s the most authentic limited edition Joey Dunlop replica helmet produced using the actual design and sponsors from 1985. The helmet will be a Celebration of Joey Dunlop’s success throughout his racing career, particularly the 1985 Isle of Man TT Races where Joey had three first place finishes; the ‘Junior TT’; the ‘Formula 1 TT’ and the Blue Riband ‘Senior TT’. Joey also had three first places at the Ulster GP and two at the NW200 in the same year. The helmet will also be on display at this year’s Classic TT Races presented by Bennetts, which will feature a display of 25 authentic machines raced by Joey Dunlop in his 24 year career including a number of his Isle of Man TT winning machines. The 80’s themed Classic TT Festival will also include a parade lap – ‘Joey Dunlop Road Racing Legend – The Rivals’ sponsored by the Isle of Man Steam Packet Company featuring many of his closest competitors.